Franklin explained that King knew power is fundamentally the focus of politics and that excluded people need political and economic “goods” to effectively work in democracy. He noted that the beloved community King espoused could only come to pass when that power meets almost-divine love, the eradication of violence, the economic changes required to end poverty, and the legal reforms necessary to eliminate discrimination. In his position as the inaugural James T. and Berta R. Laney Chair in Moral Leadership at Candler, The Rev. Dr. Robert M. Franklin Jr., challenges students to explore the concept of moral leadership in the 21st century in different cultures and contexts in the United States and around the world. Now in his second term at Emory, Franklin is a former Presidential Distinguished Professor of Social Ethics and a senior fellow at the Center for the Study of Law and Religion, both at Emory, and was also the founding director of Candler’s Black Church Studies program from 1989 to 1995. In addition to his role at Candler, which he began in 2014, Franklin is a senior advisor to the Emory University president, as well as for Community and Diversity at Emory. 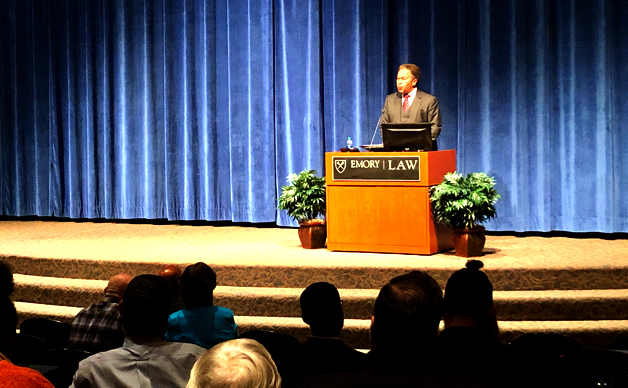 Audio from Emory Law 2019 MLK Day Lecture featuring Robert M. Franklin Jr.